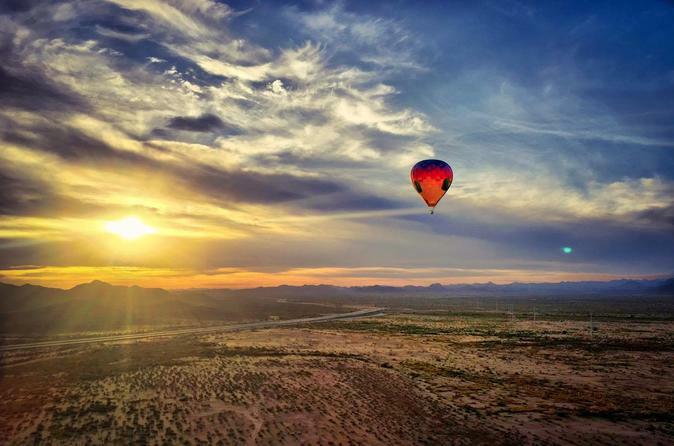 A morning hot-air balloon ride over Phoenix is an exhilarating experience. After your flight, enjoy a gourmet champagne breakfast for the perfect start to your day. "A magic carpet ride" and "riding on a cloud" are two phrases that have been used to describe the beauty, exhilaration and gentleness of ballooning. Even though you travel at speeds of five to six miles per hour, there is virtually no sensation of motion because you are flying with the wind. As you gently leave the ground, you'll be amazed at how light the balloon feels. Your time up, up and away is approximately 60 minutes. During your breathtaking journey, enjoy floating at different elevations from as high up as 5,000-feet (1524-meters) in the air to within feet of the ground. You'll take in gorgeous views of the Sonoran Desert, the impressive giant saguaro cacti and the other local flora and fauna. Upon landing you'll relish in a ballooning tradition - a toast with chilled champagne! Post-flight you will enjoy cuisine catered by the award-winning Vincent’s on Camelback.